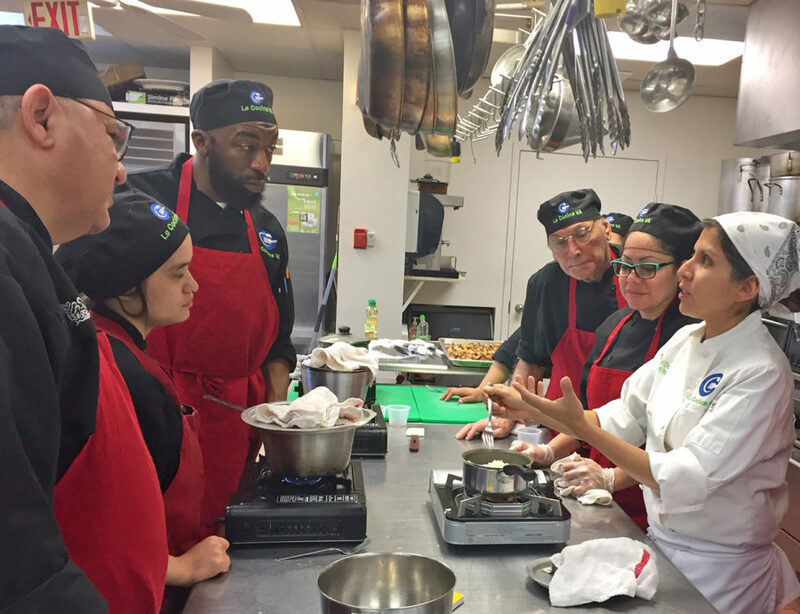 When chef Sol Orozco looks at her culinary class, she sees faces full of hope and promise. Her students range from ages 19 to 78, from Bolivians to Palestinians, and they are all looking for better-paying jobs and a path to self-sufficiency. La Cocina VA, a culinary training program housed in a church kitchen, offers that. It quickens the route by which low-income workers can get higher-skilled jobs and improve their English. At no cost to the students, the 16-week non-profit program prepares unemployed or underemployed people for careers in the food service industry. Its track record is solid: 85% job placement and 78% still employed after two years. These jobs offer hourly rates from $14.30 to $21.00, provided by more than 50 employer partners. While some students have previous kitchen experience, the most important quality La Cocina VA looks for is “their work ethics, like being on time. They have to be open, humble, willing to learn,” says Orozco. Most of the classes take place in the kitchen of Mt. Olivet Methodist Church in Arlington, with 10 or so red-aproned students intently watching Orozco demonstrate everything from knife skills to how to “make a proper rice pilaf.” Making meals, Orozco doles out rapid-fire instructions and responsibility. When the program started from scratch in 2014, Mt. Olivet was an original sponsor. Since then, corporate partners Wegmans, Capital One, Wells Fargo, Nestle and more have supported the effort. Chefs, nutritionists and business development experts helped dreams take off. Nearby restaurants and hotels, such as Hyatt Regency Tysons Corner, Alexandria Restaurant Group, Hilton Hotels, Wegmans and Sodexo, offer a week of “shadowing” experiences so students can see first-hand what a commercial kitchen’s pressures feel like. They also provide a one-month paid internship. A workforce development instructor teaches students employment readiness, such as a positive work attitude and techniques for successful job interviewing. Students also improve their English-speaking abilities, through classes customized for the culinary workplace, and complete a ServSafe course on food safety and sanitation. Now La Cocina VA has branched out to preparing healthy meals for low-income families. Students make 10,000 meals a year for families living in a homeless shelter in Arlington or in affordable housing managed by Arlington Partnership for Affordable Housing (APAH). These healthier meals contain at least 50% fruits and vegetables, aiming to help reverse obesity among people receiving the meals. Another new effort is La Cocina VA’s Zero Barriers Training and Entrepreneurship Center, now being built on Columbia Pike. It will triple the organization’s capacity to serve people from the immigrant community, other people of color and veterans. They can more likely become entrepreneurs since they will get commercial kitchen space, training, and exposure to micro lending and distribution opportunities. The organization also wants to create a self-sustained model by providing catering services for private events and local contracts as well as opening a community kitchen and its own line of food products. Daniela Hurtado has been the programs manager of La Cocina VA since 2017. She has worked more than 15 years in the culinary education field and the nonprofit sector.